Active Autowerke is familiar with some of the unique issues that 2011 and newer N55 135i, 335i and 535i owners experience even running with the factory BMW boost. 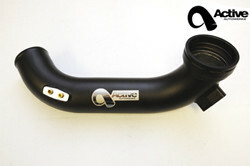 The Active Autowerke N55 Charge Pipe is a designated product designed from inception to cure and eliminate this problem. Owners of BMW with the N55 engine understands that additional power can be reliably maintained with the use of Water/Methanol injection as an added feature. However, the N55 current does not have a reliable source to accomodiate the application of a Water/Metahol nozzles. The BMW N55 engine does not utilize external diverter valves like it's N54 predecessor. Rather, the N55 diverter valves are built internally inside the engine turbo compressor housings and no in the charge pipe. As such, there are no provisions to add larger BOVs.